The strongest memory I have about this album involves one of my teachers in high school. At the time, I wouldn’t have admitted to thinking he was cute. Heck, I really didn’t know what was going on with my hormones to tell. Compared with all the other teachers on the faculty, he was a kid, probably not more than 10 years older than I was. I didn’t really give age much nuance back then — he was an adult, so he fell under the broad stroke of old. As a student, I never really liked raising my hand and asking for help. I perceived that as a sign of weakness. But on that first summer of high school, I was underwater. The school threw us into a geometry class that required Algebra I, and most of us hadn’t taken algebra. So I had to ask for help. A lot. And I didn’t mind because, well, the teacher’s cologne smelled nice. He was also building his music collection, and one of the albums he owned was Birth, School, Work, Death by The Godfathers. The album cover intrigued me, and it struck me as something I probably would like. A friend of mine had picked it up based on said teacher’s recommendation and encouraged me to do so as well. I choose my purchases carefully back then, so I didn’t follow up. Not for another 30 years. 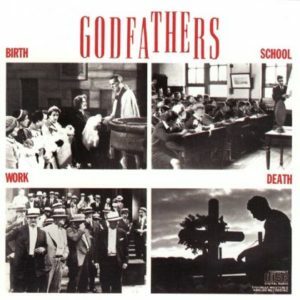 I probably would have dug the Godfathers quite a bit. Birth, School, Work, Death has the reverb-drenched commercial sheen required of post-punk albums at the time, but it didn’t polish off all the rough edges from the band. The Clash is an obvious influence, especially with the shouted choruses and Peter Coyne’s monotone verses. But that influence is tempered with a dash of classic rock and some well-timed melodies. I hadn’t quite gotten into the rougher areas of punk, so the Godfathers would have been an appropriate gateway band. Birth, School, Work, Death also has a cover that absolutely sells the album. If I had discovered the album by other means, I still would have found the austerity of the cover fascinating. As it stands, Birth, School, Work, Death marks the first time my life ever resembled a song by The Police.